One of the most interesting collisions between an implementation of a technology and the state of the art, is the Street View feature on Google Maps. I love it. I play around with it a lot. Wandering around streets near locations I am headed towards or places I know well. It works really well on the iPhone so I often check out the Street View view of places where I am. I was doing this last night while at the Westbank Cafe with Akiko celebrating Tater’s girlfriend Kelli’s b’day. I was looking at Street View with Tater, which was interesting because it was snowing last night in NYC and the Street View shots show a beautiful summer day and the construction on 42nd Street, that’s going on there now, is non-existant. But then we noticed something very strange going on with the bus across the street. It’s like some kind of spirit photography or something. The bus appears to be running over some kind of alternate reality of itself. If you poke around on Street View you see a lot of this same kind of weirdness. It’s reminiscent of the kinds of things you see in early photography, when exposure times were longer. But it comes from the fact that we don’t really have a way of capturing images in a way that would solve this. Its a collision between the nature of conventional photography and the nature of virtual reality. Unintentionally artistic. All maps contain a hint of time as well as space, but Street View (and Satellite view for that matter) amp up the sense of time to the point where it becomes spooky and weird. It also reminds me of the extreme photography of Michael Wesely. He does long exposures. VERY long exposures. Years long. Here’s a blog with some of his pictures. I saw some of his “Open Shutter” photos at MOMA here in New York a few years back, and they had a profound effect on my sense of time. The more something moves the less you can see it in the pictures. Trees turn into trunks that slowly fade to sharp points. The sun is a series of rough edged streaks across the sky. There are no people. This entry was posted on Sunday, December 20th, 2009 at 1:50 pm	and is filed under Main Blog. You can follow any responses to this entry through the RSS 2.0 feed. You can leave a response, or trackback from your own site. 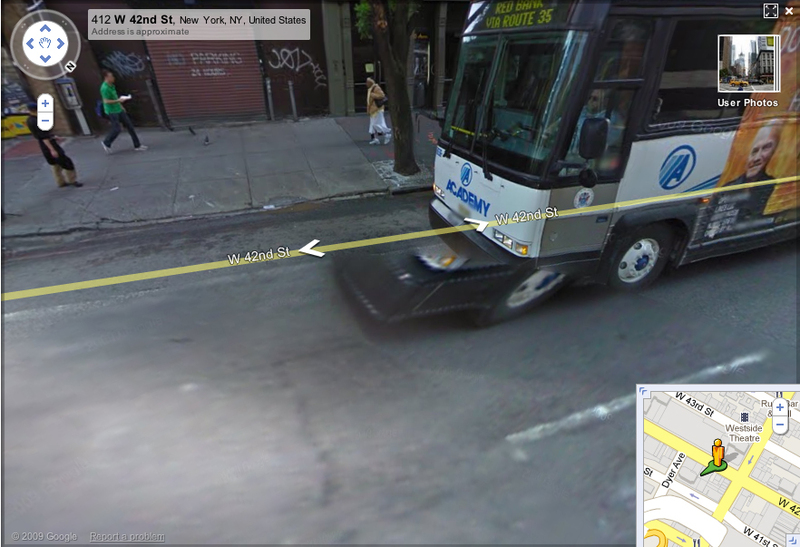 dude seriously, the streetview car hit a BUMP. Camera’s are far from perfect. check out 100 keptie st, arbroath, scotland, uk. top window. and tell me its now creepy!!! This was interesting viewing. But here’s something BETTER!!! I was messing on Google maps one day walking up and down through the town i used to live in when i came across what appears to be a ghostly apparaition in a shop window….Don’t believe me??? Check it out for yourself. First go to “Finkle Street, Stockton on Tees United Kingdom” Then look for a shop called “Polly Flinders” sells antique looking christening dresses. Zoom in on shop window and see for yourself – what looks to be a womans face with hair pulled back tightly in bun. Love to hear what other people think of this.